Moore, P. J., (2012). Supporting the language and learning development of EAL students in Australian higher education. Studies in Self-Access Learning Journal, 3(2), 182-195. The role of learning advising in improving the educational outcomes of students for whom English is an additional language (EAL) in Australian universities has received significant attention in recent years. A combination of research findings, governmental pressure and media scrutiny has provided renewed impetus for universities to address issues of language proficiency and academic literacy amongst the growing population of onshore international students for whom English is an additional language (EAL). In this paper, I discuss the role of academic language and learning advising in the Australian university context, including how this practice is influenced by a range of political, pedagogical and practical factors. In doing so, I draw on Carson and Mynard’s (2012) analysis of the aims, practices, skills, locations and discourses of advising in language learning to explore how the two fields might inform each other. Apart from a shared acronym, the emerging field of advising in language learning (Carson & Mynard, 2012) shares many features with academic language and learning in Australia; including the provision of individual consultations (ICs) as an important component. This paper explores the role of learning advising within the Australian university context, and how a renewed focus on English language proficiency in Australian higher education might call for stronger links between the two fields, and a more explicit focus on language development in ICs. The paper first briefly outlines the current context of higher education in Australia with regard to the English language proficiency of EAL students. Following Carson & Mynard’s (2012) analysis of the role of the ‘(language) learning advisor’, I then explore the role of the academic language and learning advisor in the changing Australian university context, in terms of the aims, practices, skills, locations and discourses of learning advising. While there has long been public discussion regarding the English language proficiency of international students in Australia, renewed impetus began in 2006, when a report into Australia’s skilled migration policy reported that international students’ “deficits” in terms of English communication and Australian cultural knowledge were not being met by their academic training (Birrell, Hawthorne, & Richardson, 2006, p. 33). Although Birrell’s contributions to the higher education debate reinforced the portrayal of EAL students as ‘deficient’ and in need of remedial and supplementary English classes (cf. Birrell 2006, p. 63), it also had the effect of raising the profile of English language proficiency in higher education on the federal agenda. This was followed by a series of federal reports, laws, codes, principles and the creation of a new standards authority, each of which relates to English language proficiency in higher education, as outlined in Table 1 below. Table 1. 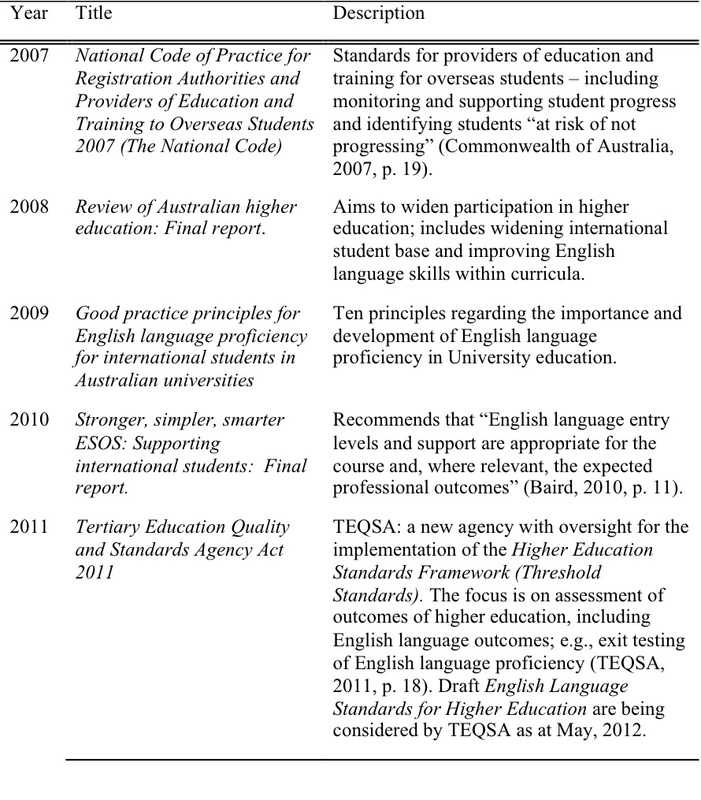 A policy framework for English language proficiency in Australian higher education. In sum, the policy framework for English language proficiency support for EAL students aims to establish ‘appropriate’ entry standards, to monitor progress and support students ‘at risk’, and to assure that relevant outcomes are met, in terms of successful completion and finding employment. Harper, Prentice and Wilson (2011) reject the argument that language proficiency is distinct from, and a pre-requisite for, academic literacy and professional skills. They also reject the argument that there is an identifiable “threshold level [of proficiency] which students must traverse in order to participate in academic or professional literacies” (p. 41), asserting that this approach encourages an approach to support that is remedial, decontextualised, and which construes EAL students as deficient. Harper et al. suggest a model of integrated literacies (academic, professional and ‘everyday’) which have a common “generic core of knowledge and skills in English;” each of which develops simultaneously (pp. 45-6). They further argue that a decontextualised focus on generic language proficiency (which they equate with grammatical instruction) is of little value, and that what is needed is “immersion in the language domain and supported development within the domain of language use: the discipline.” (p. 46). The above responses to the GPPs in terms of defining language proficiency provide an insight into how issues of language proficiency in one context can influence definitions of language proficiency itself. These interpretations also have direct implications for how the development of English language proficiency is supported in higher education. Our primary role therefore is to assist students to understand the cultures, purposes and conventions of different academic genres and practices … This objective of teaching students how to take control of their academic writing and learning is fundamental to our pedagogic philosophy. Many universities are developing and implementing English language proficiency support strategies, which often involve collaboration among faculties, support units, humanities schools focusing on language and/or linguistics, and on-campus providers of pre-tertiary English language intensive courses for overseas students (ELICOS). In some cases, university support services have been restructured under themes closely related to English language proficiency; see, for example, the University of South Australia’s (2011) Language and Learning Services (L3) and the University of Technology Sydney’s (2012) Higher Education Language and Presentation Support (HELPS) program. These programs in particular share a focus (though not exclusively) on the provision of generic extra-curricula support in the form of online materials, workshops and individual consultations. To some extent, this involves a refocusing and rebranding of existing academic language and learning support services, which are provided at most universities in Australia. The strong message in the GPPs and related policy (e.g., Bradley, Noonan, Nugent & Scales, 2008) is that activities focused on the development of English language proficiency should be embedded in coursework and assessment. While language and learning advisors collaborate with faculty academics on projects to integrate a focus on the development of language, academic and/or professional communication skills within curricula (e.g., Dunworth & Briguglio, 2010; Shaw, Moore & Gandhidasan, 2007), a strong focus on integration can have the effect of devaluing more generic language and learning advising activities, including individual consultations (cf. Percy, James, Stirling & Walker, 2004, for example). Academic language and learning advisors in Australian universities play several roles (cf. Percy et al., 2004 for a representation of the range of practices at my university), but here I focus on the practice of advising in individual consultations (ICs) with students, which is the closest to the practice of learning advising outlined by Carson and Mynard (2012). Carson and Mynard outline five aspects of advising for language learning – aims, practices, skills, locations, and discourse – and these are explored here with regard to academic language and learning advising in the context of Australian higher education. The aim of learning advising in contexts outlined by Carson and Mynard (2012) is essentially to foster learner autonomy through various processes, such as helping learners to identify their own language learning needs, select appropriate resources and evaluate their language learning. Within the Australian context outlined above, the major aims of learning advising are to support university learning in general, and to support the development of academic literacy in students in their chosen disciplines in particular. Supporting the development of English language proficiency for other purposes (e.g., social or professional communication) may also be a focus of ICs, and this focus may become stronger as universities address the issues arising from government reports and policies mentioned earlier, particularly relating to preparing graduates who are able to live and work successfully in Australian society. While the language and learning advisor’s aims may be fostering the development of disciplinary language and learning skills in the learner, the majority of students in the current context engage in ICs with a strong focus on written assessment tasks. Learning advising is often construed by non-specialists as editing (Woodward-Kron, 2007) or ‘fixing learners’ language problems.’ Students may also attend ICs with the express purpose of having the grammar or expression in their written assignments ‘fixed;’ hence the need for explicit guidelines regarding the aim of ICs. Lea & Street (1998) identify three approaches to supporting learning in higher education: academic skills, academic socialisation and tertiary literacies approaches. They associate an academic skills approach with a deficit model (mentioned earlier) where the focus of interventions is remediation, while the academic socialisation approach aims to acculturate learners to so-called homogeneous disciplinary discourses. They propose a tertiary literacies approach which emphasises learners’ negotiation of disciplinary practices, arguing that such practices are neither homogenous nor fixed. They further argue that the tertiary literacies approach is intended to subsume rather than replace the other approaches. Given their common focus on disciplinary discourse, ICs often involve advisors attempting to deconstruct this implicit discourse and make it explicit to the learners. This often involves placing the learner in the position of content expert (e.g., Clerehan, 1997), while the advisor, in collaboration with the learner, attempts to interpret the disciplinary discourse and the learner’s attempts at constructing ‘appropriate’ texts. This work is informed by a range of fields, such as genre theory, applied linguistics, systemic functional linguistics and critical theory, as well as the diverse backgrounds from which language advisors come (Percy & Stirling, 2004). Like the approach outlined by Carson and Mynard (2012), the emphasis of ICs in the Australian context is on the co-construction of knowledge (e.g., Clerehan, 1997; Wilson, Li, Collins & Couchman, 1998; Woodward-Kron, 2007) as well as the scaffolded development of learner autonomy (Collins, Shrensky, & Wilson, 1998). In this context, while learning advisors might come from a range of academic backgrounds, “having some foundation in language, literacy, learning and pedagogical theory provides us [learning advisors] with the tools to negotiate and ‘unpack’ the variety of discourses and teaching practices that we are expected to deal with on a daily basis” (Percy & Stirling, 2004, p. 55). Given the diversity of discourses with which learning advisors are engaged, to some extent a background in the discourse of any academic discipline adds to the richness of the field. Carson & Mynard (2012) point to studies where advising occurs online or in classrooms, but they note that the main site for language learning advising is the self-access centre. Learning advising in Australian higher education occurs in a range of contexts, and, as noted above, advisors come from a range of backgrounds. Of nearly 500 learning advisors in Australian institutions approximately half are academic staff, the other half being general staff, and the majority of these are employed in centralised academic language and learning units, though a significant number are employed within faculties (AALL, 2011). ICs may be located in centralised units, in faculties, in classrooms, or they may be conducted through communications technology for distance students. Engagement in ICs may be initiated, for example, by a student, as the result of a recommendation from a faculty academic, or as part of a broader collaborative project between learning advisors and faculty academics. While ICs may be offered on a voluntary and confidential basis, they also may be recommended as part of a program to support students deemed ‘at risk’ under the National Code 2007 (see Table 1). These and other contextual features (e.g., time allocated, limitations on access, university policy; Stevenson & Kokkinn ) may influence the interaction between advisor and learner and the IC’s outcomes. One of the advantages of locating language learning advising in a self-access centre, as noted by Carson and Mynard (2012), is that resources to support learners’ language development are available in the immediate environment. 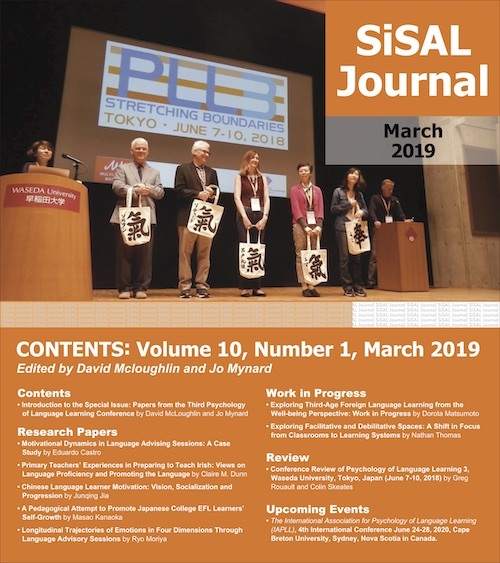 While centralised units in Australian contexts offer easily accessible resources in print or online to support student learning, outside language learning programs there is no clear mention of comprehensively-resourced self-access centres in the literature. There has been little research into the discourse of ICs in Australian higher education, but the research that has been carried out, like that identified by Carson & Mynard (2012), provides insights into the nature of learning advising, theoretical perspectives informing such practice, and the strategies advisors and learners engage in. Collins et al. (1998) aimed to identify strategies learners and advisors used to develop learner autonomy, drawing on the notion of scaffolding within Vygotsky’s (1978) zone of proximal development (ZPD), as well as previous applications of counselling strategies to learning advising (e.g., Chanock, 1995; Kelly, 1996). Based on advisor reflections and videoed ICs, they identified a range of teacher-dominated, collaborative and learner-dominated strategies which arose in learner-advisor interaction. They note that an integral part of learning advising is recognising when it is appropriate to use didactic and/or more learner-directed strategies. Clerehan (1997), drawing on a range of theoretical perspectives, also investigated scaffolding within the ZPD by analysing the dialogic construction of learning in three ICs. Her analysis highlights the collaborative nature of the discourse, stages through which the discourse progresses, and how both advisor and learner negotiate objectives of the interaction at different stages. One notable finding related to the fact that opportunities for learning arose from the interaction, rather than from the individual participants, and that knowledge is constructed for both advisor and learner in the interaction. Woodward-Kron (2007; cf. also Woodward-Kron & Jamieson, 2007) similarly investigated ICs from the perspective of systemic functional linguistics (SFL), providing a rich analysis of discourse, including joint construction of meaning, scaffolding and addressing a wide range of aspects of textual and contextual features of the learner’s text. Woodward-Kron’s research provides insights into the range of negotiation taking place in ICs – related to linguistic form and textual organisation on the surface level, to in-depth analysis of the learner’s written communication (in content and form), to interpersonal negotiation of the advisor-learner relationship. Finally, Wilson et al. (2011), in an extension of Collins et al.’s (1998) research, provide what they call an “analytical framework of teacher discourse in one-to-one academic literacy sessions” (p. A151), based on their analysis of an IC. They represent advising practice along two intersecting continua; the first, “literacy focus”, draws on Lea & Street’s distinction (1998, see above) between a skills focus and a tertiary literacies focus; the second, “pedagogic positioning”, distinguishes between didactic and collaborative pedagogy. Based on these distinctions, they argue for “a contingent approach … in which advisers adapt their discourse strategies to meet students’ needs as they guide them towards an increasingly independent and critical approach to academic literacy” (p. A151). In summary, discourse analysis research in learning advising in Australian higher educational settings has drawn on a range of theories and models (e.g., Vygotskian, SFL, tertiary literacies) to investigate advising practice, to provide advisors with an awareness of the range of strategies available to them, and to represent advising as a dynamic context of interaction, requiring various levels of negotiation. Chanock (2007) argues that the effectiveness of ICs is ‘invisible’ in that it is not possible to objectively link them to learner outcomes; though see Stevenson & Kokkinn (2009) for a comprehensive attempt at IC evaluation. Chanock (2007) also argues that the input from ICs to other forms of learning advising (e.g., workshops and integration of tertiary literacies into faculty curricula) is invaluable, citing one ALL advisor, whose IC program was discontinued: “We no longer see students; therefore we no longer have their version of their problems” (p. A2). This paper has outlined similarities and differences between academic language and learning advising in the context of Australian higher education, and the field of (language) learning advising, as outlined by Carson & Mynard (2012), in an attempt to explore how these fields might inform each other’s development. Both fields draw on similar theoretical and methodological approaches and share a focus on learner autonomy; however, the former privileges the development of tertiary literacies, while the latter privileges the development of language proficiency. In addition, advising practice in the context of Australian higher education is strongly influenced by a constantly evolving national policy framework, which is currently focused on the development of teaching and learning standards and outcomes measurement. Given the stronger, if not clearly defined, focus on ‘English language proficiency’ in Australian higher education, the field of academic language and learning advising may learn from the burgeoning field of advising for language learning, in terms of broadening its focus from the ‘academic’ to other fields of communication in order to support students’ social and professional language and learning-related goals. In the other direction, the field of advising for language learning may benefit by drawing on academic language and learning research into ICs (outlined above), as well the broader research into the integration of language and learning support into core tertiary studies, involving collaborations among language, learning and discipline specialists, as well as other stakeholders. 1. The definitions and perspectives here are illustrative of the current discussion in Australian higher education. For a more in-depth discussion of the complexities and history of ‘English language proficiency’ in language testing in particular, see Chapter 3 of McNamara (1996). Thanks to Ben Fenton-Smith for feedback on the conference presentation on which this article is based, and to Jo Mynard for sharing her expertise during my visit to KUIS. Thanks also to the reviewers for their valuable comments. Paul Moore works as a lecturer (language specialist) in Learning Development at the University of Wollongong. His work involves a range of activities from student consultation and teaching, to collaboration with teaching staff from a range of faculties, to policy development. Current research interests include discourse analysis, task-based interaction, form-focused instruction and English for specific purposes. Australian Universities Quality Agency (AUQA) (2009). Good practice principles for English language proficiency for international students in Australian universities, Report to the Department of Education, Employment and Workplace Relations, Canberra. Baird, B. (2010, February). Stronger, simpler, smarter ESOS: Supporting international students – Final report. Review of the Education Services for Overseas Students (ESOS) Act 2000. Canberra: Commonwealth of Australia. Birrell, B. (2006). Implications of low English standards among overseas students at Australian universities, People and Place, 14(4), 53–64. Carson, L., & Mynard, J. (2012). Introduction. In J. Mynard & L. Carson (Eds. ), Advising in language learning: Dialogue, tools and context (pp. 3-25). Harlow: Pearson Education. Chanock, K. (1995). Counselling and academic skills teaching: what person-centred counselling can tell us about person-centred skills, in Garner M., Chanock K., & Clerehan R. (eds) Academic skills advising: Towards a discipline (pp. 30-39). Melbourne: Victorian Language and Learning Network. Chanock, K. (2007). Valuing individual consultations as input into other modes of teaching. Journal of Academic Language & Learning, 1(1), A1-A9. Clerehan, R. (1997). How does dialogic learning work? In K. Chanock, V. Burley & S. Davies (Eds. ), What do we learn from teaching one-to-one that informs our work with larger numbers? Proceedings of the conference held at La Trobe University November 18-19, 1996 (pp. 69-81). Melbourne: Language and Academic Skills Units of La Trobe University. Collins G., Shrensky, R., & Wilson, K. (1998). Visions of autonomy: Teaching strategies in one-to-one support for international students. Proceedings of the 9th International Student Advisers Network of Australia (ISANA) Conference, 1–4 December 1998, Canberra: ISANA. Commonwealth of Australia (2007). National Code of Practice for Registration Authorities and Providers of Education and Training to Overseas Students 2007 (The National Code 2007). Canberra: Commonwealth of Australia. Dunworth, K., & Briguglio, C. (2010). Collaborating across boundaries: Developing a cross-departmental approach to English language development in an undergraduate business unit. Journal of Academic Language and Learning, 4(1), A13-A23. Harper, R., Prentice, S., & Wilson K. (2011). English language perplexity: Articulating the tensions in the DEEWR “Good Practice Principles.” The International Journal of the First Year in Higher Education, 2(1), 36-48. Kelly, R. (1996). Language counselling for learner autonomy. In R. Pemberton, E.S.L. Li, W.W.F. Or & H.D. Pierson (Eds), Taking control: Autonomy in language learning (pp. 93-113). Hong Kong: Hong Kong University Press. Lea, M., & Street, B. (1998). Student writing in higher education: An academic literacies approach. Studies in Higher Education, 23, 157–72. McNamara, T. (1996). Measuring Second Language Performance. London and New York: Longman. Murray, N. (2010). Conceptualising the English language needs of first year university students. The International Journal of the First Year in Higher Education, 1(1), 55-64. Murray, N. (in press). Ten ‘Good Practice Principles’ … ten key questions: Considerations in addressing the English language needs of higher education students. Higher Education Research and Development. Percy, A., James, B., Stirling, J., & Walker, R. (2004). Learning advising practice and reform: a perspective from the University of Wollongong, Australia. Journal for Educational Reform 9(4), 22-38. Percy, A., & Stirling, J. (2004). Coming of age: Developing a genealogy of knowledge in the LAS field. In LAS 2003 National Conference Refereed Proceedings (pp. 37-45). Australia: Flinders University. Shaw, J., Moore, P., & Gandhidasan, S. (2007). Educational acculturation and academic integrity: Outcomes of an intervention subject for international post-graduate students in Public Health. Journal of Academic Language and Learning 1(1), A55-A66. Stevenson, M., & Kokkinn, B. (2009). Evaluating one-to-one sessions of academic language and learning. Journal of Academic Language & Learning, 3(2), A36-A50. Vygotsky, L. 1978. Mind in society: The development of higher psychological processes. Cambridge, MA: Harvard Press. Wilson, K., Li, L. Collins, G., & Couchman, J. (2011). Co-constructing academic literacy: Examining teacher-student discourse in a one-to-one consultation. Journal of Academic Language & Learning, 5(1), A139-A153. Woodward-Kron, R. (2007). Negotiating meanings and scaffolding learning: Writing support for non-English speaking background postgraduate students. Higher Education Research and Development, 26(3), 253-268. Woodward-Kron, R., & Jamieson, H. (2007). Tensions in the writing support consultations: Negotiating meanings in unfamiliar territory. In C. Gitsaki (Ed. ), Language and Languages: Global and local tensions (pp. 40-61). Newcastle, UK: Cambridge Scholars Publication.